With its high magnification and large objective diameter, the new 6.5x-20x50mm E1 riflescope is ideal for engaging targets at long distances. This scope is equipped with the E1 MV reticle that is specifically calibrated for the .22-250 Rem. cartridge, making it the ultimate varmint scope. 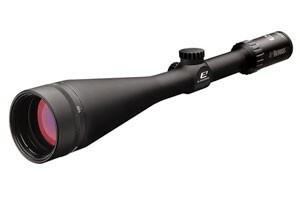 The 6x-20x 50mm E1 scope will retail for $449. The new 4.5x-14x-42mm scope with 30mm tube will provide more light, therefore increasing your shooting time in the field. Additionally, the 30mm tube on this scope allows for a wider adjustment range for windage and elevation. Suggested retail on the new 30mm scope is $449 and the 1-inch model retails for $349. The popular 3x-9x-40mm E1 riflescope is now available in two new configurations. It will now be available with a 30mm tube and with an illuminated reticle in a 1-inch tube. The illuminated reticle will enhance accuracy in low-light conditions. The retail price for both models is $299. All the scopes in the Fullfield E1 line feature the upgraded windage/elevation knobs and a separate ring and eyepiece that readily accept flip-up lens caps. Internally, the scopes feature precision-ground lenses that are larger than the lenses of comparable scopes, allowing for better light transmission. The lenses are index-matched with Burris HiLume multi-coatings. The E1 line also features double erector springs and positive steel-on-steel adjustments for repeatable accuracy. The new E1 riflescopes will be available at retailers nationwide in the first quarter of 2012. LaserLyte CK-MS Bersa Thunder Product Update!